418 Beacon is located on the north side of Beacon, between Gloucester and Hereford, with 416 Beacon to the east and 420 Beacon to the west. 418 Beacon was designed by James T. Kelley, architect, and built in 1897-1898 by McNeil Brothers, carpenters, one of two houses (416-418 Beacon) designed in a closely similar style for Henry Howard Fay and his wife, Elizabeth Elliot (Spooner) Fay. 416 Beacon was built first, in 1890-1891, and was the Fays home until 418 Beacon was completed. Henry Fay is shown as the owner of 418 Beacon on the original building permit application, dated September 15, 1897, and on an accompanying application to build a stable, dated December 9, 1897. 416-418 Beacon were built on a 60 foot wide lot that Henry Fay purchased on May 26, 1888, from Dudley L. Pickman. Dudley Pickman had purchased the land on January 25, 1887, from George Higginson, part of a 330 foot parcel he had purchased on January 14, 1884, from the Boston and Roxbury Mill Corporation. Click here for an index to the deeds for 418 Beacon. 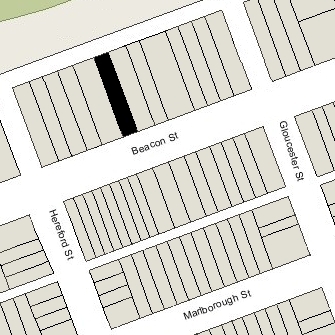 By the 1898-1899 winter season, Henry and Elizabeth Fay had moved from 416 Beacon to 418 Beacon. They also maintained a home in Wood’s Hole, where he was the prime mover in formation of the Wood’s Hole Golf Club in 1898. On October 24, 1916, the Fays joined with the owners of 416 Beacon and 420-426 Beacon in an agreement to “impose a uniform restriction on their estates which will prevent the erection of any building or other structure in the rear of any of the said estates which will further materially obstruct the light, air and prospect now enjoyed.” The agreement specified that, prior to January 1, 1937, no building more than one story high could be built north of a line 92 feet north of the building line established by City of Boston for Beacon Street (the building line required a 20 foot setback from the north side of Beacon). Henry Fay died in March of 1920. 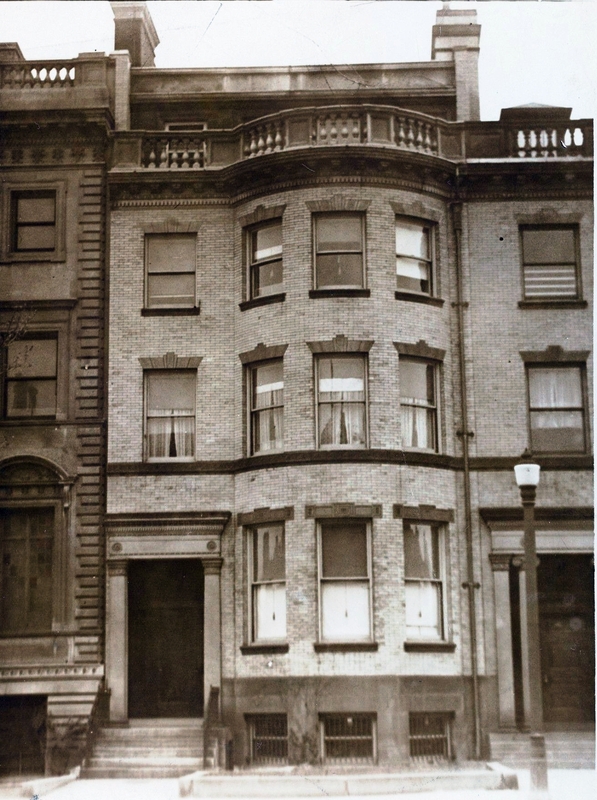 Elizabeth Fay continued to live at 418 Beacon during the 1921-1922 winter season, but moved thereafter to 330 Beacon, where she and her husband had lived from the mid-1870s until the early 1890s, before moving to 416 Beacon. On June 13, 1922, 418 Beacon was acquired from Henry Fay’s estate by Louisa (Louise) (Clap/Clapp) Colburn Endicott, the former wife of leather merchant Isaac Colburn and the widow of shoe manufacturer Henry Bradford Endicott. Henry Endicott had died in February of 1920. They had lived in Dedham, where she continued to maintain a home. She also maintained a home in Beverly. Louisa Endicott’s children by her first marriage lived with her: Samuel C. Endicott and Katherine Farwell Endicott, both of whom had taken the surname Endicott. On February 16, 1924, she transferred 418 Beacon into her son’s name. They continued to live at 418 Beacon during the 1927-1928 winter season, but moved thereafter. At the time of the 1930 US Census, they were living in Dedham. Louisa Endicott died there in October of 1931. 418 Beacon was not listed in the 1929 and 1930 Blue Books and was shown as vacant in the 1930 City Directory. On August 25, 1930, 418 Beacon was acquired from Samuel Endicott by Beatrice Winfield (Cullen) Spalding, the wife of Eliot Spalding. They previously had lived in an apartment at 301 Berkeley. They also maintained a summer home at Beverly Cove. Eliot Spalding was a former officer of the Endicott Johnson Shoe Company, owned by Henry Bradford Endicott. When Henry Endicott died in 1920, Eliot Spalding was named trustee of his estate, together with Henry Wendell Endicott, Henry Bradford Endicott’s son by his first marriage, to Caroline (Carrie) Williams Russell. Beatrice Spalding’s niece, Mary Louise Gagnon, lived with them. She was the daughter of Louis Joseph Cyprien Gagnon and Rosanna (Cullen) Gagnon of Montreal. The Spaldings and Miss Gagnon continued to live at 418 Beacon during the 1934-1935 winter season, but moved thereafter to Binghamton, New York, and then to Tucson. Beatrice Spalding died in September of 1952, and in 1953 Eliot Spalding and Mary Louise Gagnon were married. On April 23, 1935, 418 Beacon was acquired from Beatrice Spalding by Catherine Frances (Murray) Carney, the wife of Joseph Patrick Carney. They previously had lived at 80 Marlborough. A former lawyer and bank president, Joseph Carney had been appointed in July of 1933 by President Roosevelt as Collector of Internal Revenue in Boston. He subsequently also served as New England Administrator of the Federal Emergency Relief Administration. In November of 1934, he was named New England director of the Reconstruction Finance Corporation. He resigned in April of 1937 and resumed his position as president of the Gardner Trust Company. The Carneys continued to live at 418 Beacon until about 1941, when they moved to Worcester. After they moved from 418 Beacon, the Carneys leased 418 Beacon to others and it was operated as a lodging house. On October 30, 1942, 418 Beacon was purchased from Catherine Carney by John Der Hovanesian and his wife, Marian (Israelian) Der Hovanesian. The lived in Marlborough, Massachusetts, where he was manager of the Hillside Dairy. After acquiring the house, John Der Hovanesian applied for a lodging house license and was advised by the Building Department that the property had not been legally approved for that purpose. It appears that such approvals were subsequently obtained, inasmuch as the property continued to be operated as a lodging house. On June 14, 1944, 418 Beacon was acquired from the Der Hovanesians by Elizabeth Krauss, who operated it as a lodging house. She lived at 115 Beacon and also operated lodging houses there and at 141 Beacon. On May 15, 1946, 418 Beacon was acquired by Dr. Alonzo Jay Shadman, a physician and president of the forest Hills General Hospital. He lived in Jamaica Plain. 418 Beacon continued to be operated as a lodging house by Elizabeth Krauss. On March 31, 1948, 418 Beacon was acquired from Dr. Shadman by Hugh J. Campbell and his wife, Catherine Mary (Furey) Campbell. They previously had lived at 491 Commonwealth. 418 Beacon continued to be a lodging house. Although the Campbells had made it their home, Elizabeth Krauss continued to be shown as the lodging house operator in the City Directories through the mid-1950s. Hugh Campbell died in January of 1950. 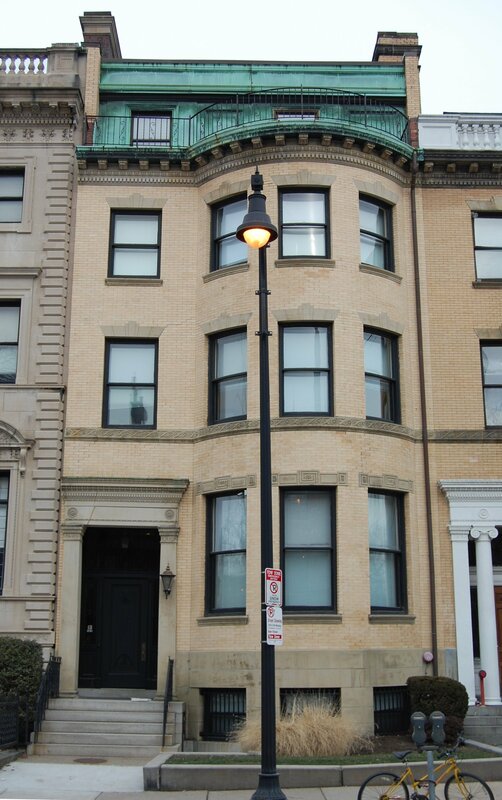 Elizabeth Campbell continued to live at 418 Beacon until her death in June of 1965. In her will, Catherine Campbell left the house and furnishings at 418 Beacon to the Society of Jesus of New England. By 1966, 418 Beacon was a dormitory for the St. Philip Neri School, and continued as such until the early 1970s, when it was converted into a residence for Jesuit Priests (the change of use was subject to a legal action decided in July of 1978, which concluded that Catherine Campbell’s intent had been to leave the house and furnishings to the Society of Jesus for its general use, and not specifically and exclusively for the use of the St. Philip Neri School). In May of 1983, 418 Beacon was purchased from the Society of Jesus of New England by the New England College of Optometry. The College was located at 420–422–424–426 Beacon, which it had acquired in August of 1971. As part of the sale, in January of 1983 the Society of Jesus had applied for (and subsequently received) permission to establish the legal occupancy of 418 Beacon as a dormitory (for use by the College). The College noted that it was its ultimate intention to convert the building and a separate building at the rear into classrooms and other college functions, and in August of 1997 it applied for (and subsequently received) permission to do so. In October of 2006, the College applied for (and subsequently received) permission to consolidate 418 Beacon with its properties at 420-422-424-426 Beacon, with the address of 424 Beacon. The New England College of Optometry continued to be located there in 2017.